Wofford head coach Jim Brakefield was hired as Appalachian State's head football coach in 1971. He led the Mountaineers into the Southern Conference in his first season. Brakefield led the Mountaineers to three losing seasons in four years en route to a 47–48–4 record at Appalachian State, however, a 3–8 campaign in 1979 resulted in his dismissal. However, Brakefield's 1975 team won impressive victories over Wake Forest (19–17) and South Carolina (35–34) in 1979. 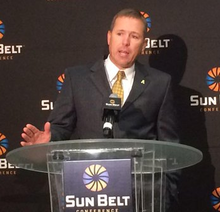 ^ "App State, Charlotte Announce Four-Game Football Series". Appalachian State University Athletics. Retrieved 2019-04-22.